Oman is one of most water-stressed countries in the world, with the northern part of Trading and Investment Establishment (TIE) contracted Australian Rain Technologies (ART) to oversee the operation of a rainfall enhancement trial using the ATLANT™ technology in the Hajar Mountains, with an independent evaluation of the results of this trial by the National Institute for Applied Statistics Research Australia (NIASRA) at the University of Wollongong. The trial operation ran for 170 days from 15 May to 31 October 2013, capturing the reported high incidence of convective storms over the Hajar Mountains with consistently suitable microphysical conditions for rainfall enhancement operations. 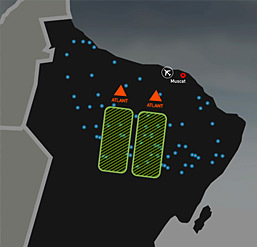 Two ATLANT™ locations were used to target the Batinah/Dakhliyah Region of Oman. The trial area included 120 rain gauges and two automatic weather stations installed by TIE, as well as weather stations and upper soundings at Seeb international airport provided by the Oman Directorate General of Meteorology and Air Navigation (DGMAN). The trial employed a randomised crossover design with the two ATLANT™s operated in a pre-determined randomised alternating schedule. Statistical spatio-temporal modelling was used to analyse the trial data. The aim of the modelling is to reduce the natural rainfall variation by using covariates to predict or explain the natural variation independently of the rainfall itself, facilitating the prediction of the level of rainfall that would have occurred if the ATLANTTM system were not operating. It was decided the down-wind arc model deployed in the analysis of the South Australian tirals was not the most robust model for defining a footprint in the Oman trial. A simple alternative was therefore developed as part of the Experiment plan prior to analysing the rainfall, which defined this footprint in terms of 'corridors' placed symmetrically about each ATLANTTM site and oriented downwind along the axis defined by the steering wind direction. The statistical analysis was conducted using a dynamic 60° downwind arc footprint model and a 30km dynamic downwind corridor footprint model based on daily steering wind direction, as specified in the pre-analysis plan. In all cases these footprints extended out 75km the ATLANTTM sites. Overall, a positive and significant rainfall enhancement effect attributable to the operation of the ATLANTTM systems was observed over the course of the trial. Overall total attribution (enhancement effect) in the trial area defined by the 30 km corridor model, as a percentage of estimated natural rainfall, wa estimated to be 18 per cent with a bootstrap standard error of 8.4 per cent. The bootstrap analysis indicates that this attribution is significantly greater than zero at a 99 per cent level of confidence, with a lower bound of 1.1 per cent for the bootstrap 90 per cent confidence interval for this attribution.